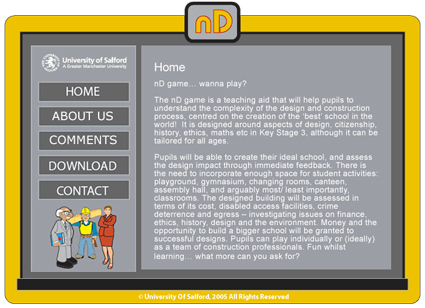 The School of Construction and Property Management at the University of Salford has developed an nD game to helppupilstounderstand the complexity of the design and construction process, centred on the creation of the best school in the world! Pupils will be able to create their ideal school, and assess the design impact through immediate feedback. Pupils can play individually, or as a team of construction professionals. The game is designed around aspects of design, citizenship, history, ethics, maths, etc., although it can be tailored for all ages.